The invite for the Honor Play unveiling promised a “groundbreaking experience”, but didn’t elaborate. And there were vague mentions of “4D gaming”, but again with no further details. 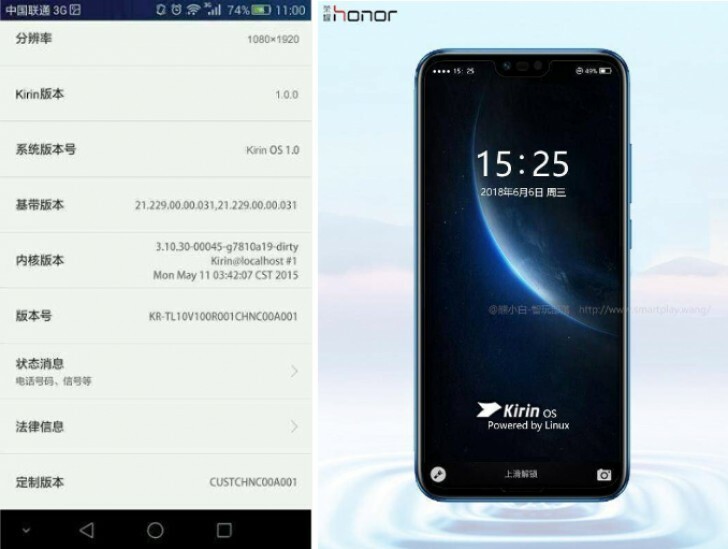 Newly surfaced images suggest that at least part of the innovation behind all these promises may be a custom OS by Huawei. Dubbed Kirin OS, it will be based on Linux. When talking about Honor Play’s innovation, Huawei’s chairman used the metaphor “flying in the sky” to illustrate the speed of the phone, perhaps due to the custom-tuned OS. This isn’t the first time we’ve heard such rumors, they date back to at least 2015. Then they popped up again in 2016. Back then it seemed like a defensive move in case Google gave Huawei the cold shoulder. Yet, given ZTE’s fate, Google might not be Huawei’s biggest worry anymore. Now, these images could well be faked, but there are plenty of custom operating systems out there, so it’s not unlikely that they are real either. Plus, in China as long as a phone runs WeChat, the underlying OS doesn’t matter. And WeChat is on Huawei’s global app store. The Play will be unveiled on June 6, so we’ll know for sure next week.